1. Preheat the oven to 200°C, gas mark 6. Drizzle a large roasting tin with 2 tbsp of the olive oil. 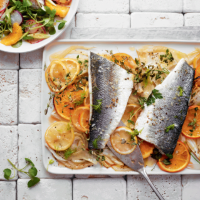 Scatter over the fennel, orange and lemon slices. Tuck in the parsley, thyme and garlic. Season well, then pour over the citrus juices and wine. 2. Cover the whole tin with foil and roast for 30 minutes. Remove the foil, season the sea bass, then add to the tray, skin-side up. Drizzle with the remaining oil and return to the oven, uncovered, for 10 minutes until the fish is just cooked through and the fennel tender. Scatter over the reserved fennel fronds.